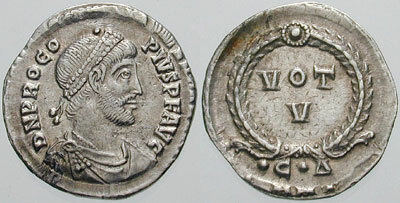 Valentinian and his brother Valens were both emperors but were not really equal partners, Valens was very much carried along in Valentinian’s coat tails. So it was Valentinian that was responsible for dividing the empire in two. The empire had been carved up in various ways for diverse reasons over its history so far. There was no particular reason why anyone, least of all Valentinian himself would have suspected that the division made in 364 would prove to be permanent. But with hindsight it is easy to see that it was in fact inevitable. The two halves of the empire were drifting apart both culturally and economically. The West was Latin speaking, and the East was Greek. The West was declining into a more agrarian way of life while the East was becoming more wealthy. The militarily minded latin speaking Valentinian felt more at home in the West, so he handed the richer but softer provinces of the East to the less belligerent Valens. Given the ever present threat of barbarian invasion across the Rhine or the Danuber, this no doubt seemed like a sensible division of labour, but it turned out that the East was where the first trouble was to arise. It was pretty much a self inflicted problem as it happens, though one that followed on pretty directly from the way emperors were selected. Procopius had retired to farm his villa and given up any pretentions to the top job. But as the last member of the house of Constantine and someone closely associated with the popular Julian, he would always be a potential focus for discontent. So it wasn’t perhaps too surprising that one day some soldiers arrived at his villa to carry him off to prison or more likely to death. Procopius may well have anticipated this move because he seemed to have a plan in place. He laid on a lavish entertainment for his would be captors then asked to say his farewells to his family. Once he was out of sight he craftily made his escape. He slipped away to the coast, got on a boat across the Black Sea and hid out in the Crimean peninsula. He had escaped with his life but his position there was precarious. He was outside the empire but still within its sphere of influence and liable to be betrayed by the local barbarians if they ever found out who he was. After several months he decided to take his chance, and secretly re-entered the empire in disguise. He found widespread discontent with the new regime. Salust was now in retirement and so not able to bring his common sense to bear on the administration. Meanwhile the non-Greek speaking Valens had both offended people with his personality and was attempting to collect back taxes from previous reigns right back to Aurelian’s nearly a hundred years before. So Procopius found the conditions ripe for rebellion. And it got better. Valens was obliged to march to Syria to act as a figurehead in new tension with the Persians. This meant the emperor was out of the capital. Not only that, but troops were being moved from the Danube to the Euphrates. On their way, units often passed through Constantinople itself. Procopius made some contacts and soon the plot was hatched. The rebellion was planned to coincide with the arrival of some legions from Gaul in the capital. These men still revered the memory of Procopius’ cousin Julian and so were easily won over. Some cash changed hands to make it easier. On the appointed day Procopius appeared in the city outside a popular bath house. He wore the purple and was acclaimed by the soldiers who were in on the plot. Word spread. His return struck a chord with the poor and oppressed and soon the whole of Constantinople was in revolt. Magistrates were siezed, arsenals were broken open to arm the supporters of the new emperor and the gates were occupied. In a move worthy of his remarkable family, a bold stroke had gained him a mighty prize. Could Procopius extend his rule beyond the walls? It looked like he could. He soon had command of the nearby garrisons. Legions sent to deal with him instead joined him. It was a game where impressions counted, so it was a huge coup when he got the backing of Faustina. She was the widow of Constantius, and so he had the backing of another member of the royal family. She also had a small daughter who rapidly became the favourite of the troops. To his real achievements Procopius added the theatre of pretending to receive diplomats from distant countries. The psychological war was as much directed at Valens as anyone else, and was hitting home. Valens considered negotiating terms with his rival. But if Valens had lost his nerve, those around him hadn’t. Salust was recalled and he acted decisively. In fact, it was probably in the nick of time. Procopius had done a deal with a Gothic warlord, obtaining significant potential forces to add to his already strong military position. He seemed to have the momentum with him. But Salust knew the men that were backing Procopius well. Salust’s plan was to avoid actual fighting wherever possible. He stationed officers who had worked with men in the units following Procopius in the front line. In two battles troops defected when they were faced by officers they had previously known, followed and respected. After the second defeat, his erstwhile supporters turned on Procopius and handed him over. He was beheaded on the spot. The pattern was a well worn one from Roman history and the rebellion is one of many in the history of the empire. But it might have been expected for the matter to end more or less as the severed head of the usurper hit the ground. But the authorities followed up with a purge of actual and supposed supporters of the revolt. This was widespread and savage. The pretext was the expunging of the practice of magic. Magic was widely believed in and widely feared, and was to remain so for hundreds of years. It is tempting to interpret this as an ideological battle against paganism. There is nothing in the sources that confirms this, and Gibbon himself doesn’t consider the notion. And it is true that Christianity has rarely advanced by outright violence against non-Christians. But even if it was simple over-reaction, it still shows that this particular uprising was one that was perceived as having widespread and persistent support. Contemporary reports depict half the population of one province being imprisoned or forced to flee as refugees. It may well not have been obvious to men at the time just how precarious the situation of the empire was soon to become, but it is still a little shocking to see just how heedless the government were of the need to keep the territories they governed in a state capable of resisting external threats. And this criticism can be made of both halves of the empire. Valentinian in the West had no internal enemies to face down, but he made a habit of meeting out rough justice. Or roughness at any rate. Rivals or suspected rivals were killed without any attempt at due process. He had no education other than his rise through the ranks and no understanding of justice – he treated civilians the same way he treated soldiers. He also had an explosive temper, which is a sure way of getting yes men rather than colleagues. He had the thin skin of a man who wasn’t sure of his ability, even though his outward attitude was confident and haughty. His main confidant was a man called Maximin, who was notable for his violence and who had slaughtered many of the senators in Rome. So not really a great team for anything other than waging war. But Valentinian did have an affectionate side. He was very fond of his pet bears called Innocence and Mica Aurea. He kept them in cages near his bed and doted on them. He sometimes amused them and himself by letting them act as executioners. In the end he let Innocence go after many years. He was a ferocious Roman emperor stained with the blood of his victims, but even so deep down he was also a bit of a softie.